This weeks blog is part two from Shannon Thomas. This list is helpful and humbling. I am feel privileged to bring you this post. 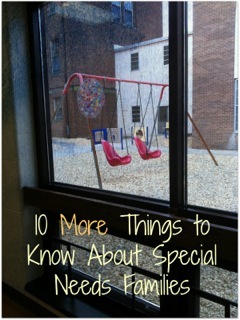 The first ten tips were general ways that any person can be more “special needs friendly”. These next ten are more personal. These tips are based on my personal experience as a special needs mom, and are appropriate for close friends, classmates, church members, neighbors, mom’s groups, or family members. If you know someone who has a special needs child, whether it is a brand new baby in the NICU, or an older child, these are some simple ways you can be helpful, show kindness, and increase your awareness. Postpartum depression, PTSD, and anxiety are very common in new special needs moms, especially if the baby has to go to NICU. Be aware of any signs that your friend is having a hard time coping with the stress and shock of having a sick baby. The whole family needs support, not just mom. Dad’s don’t verbalize their needs as often, and tend to put their feelings aside, in order to be strong for their family. Siblings are often confused, scared, and sad. Make an effort to reach out to each member of the family, not just the mother. 3. Go to the hospital. Go early, go often, and be in for the long haul. Whether the family is welcoming a sick newborn, dealing with surgery, or a treatment program for an older kid, having a child in the hospital is a full time job. It’s also lonely, traumatic, boring, stressful, and expensive. It is always better to go and not be needed, than to stay away and leave the family on their own. When you go to the hospital, don’t bring flowers or baby items. Most ICUs don’t allow them. Instead, bring non-perishable snacks, drinks, magazines, pampering items for the parents (lotion, lip balm, toiletries), pay for their parking, bring a home cooked meal, offer to sit bedside for a while, anything you can think of to make the family more comfortable on what could be a very long journey. This applies to older children in the hospital as well, who may also appreciate easy to clean toys. Arrange meals, rides, pet care, babysitting, errands, or cleaning. Don’t take no for an answer. And don’t expect the family to know what their schedule will be from day to day. Get a group of friends together and make a flexible plan. This is great anytime, not just when a child is in the hospital. Learn the name, general characteristics, and major needs of the child’s disorder. Almost every genetic anomaly or childhood disease has a foundation with a website. Educating yourself not only shows your support, but will guide you towards how you can be more helpful. Learn to do some of the child’s treatments and procedures, then offer to babysit. Many special needs kids take medications, wear hearing aides or orthotic braces, get tube feedings, are not potty trained, or require constant supervision that make finding childcare next to impossible. It is taxing and frightening being the only person dealing with those things day in and day out. Not only will it give your friend a much needed break, but it will ease their anxiety about the future care of their child. Touch the child, talk to them, and find what makes them happy. Nothing is more rewarding than making a special child laugh. Special needs parents need to be reminded that their child is lovable and welcome in this world. Learn about and give appropriate gifts. Birthdays and holidays can be tough on special needs families. While they love the child that they actually have, they may be grieving the child they imagined having. Few things sharpen that grief like opening a gift their child will never be able to enjoy due to sensory, motor, or developmental problems. Take the time to ask questions and do some research before giving a gift. But do give them!